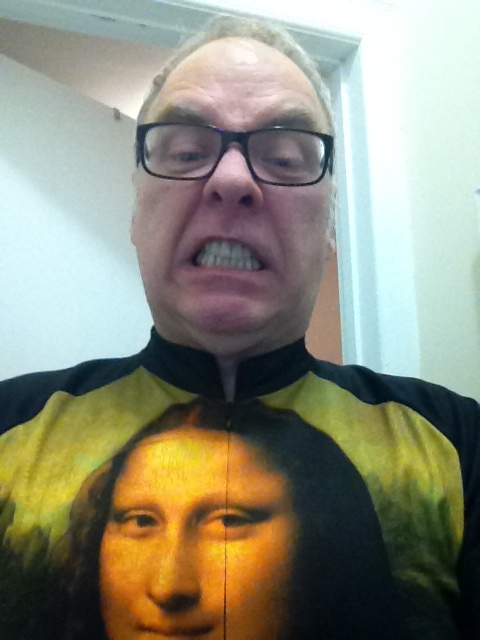 Disclaimer–Would you pay attention to economic prognostications from someone who’d take a selfie in this shirt? Oil prices have fallen off a cliff in recent weeks, declining some 45%. It has been a good time for motorists–and for the peak oil denialists to go forward with their favorite bromide, i.e., that we have found enough unconventional fossil fuel to keep the party going. But as I’ve posted before here, unconventional oil is expensive–depending on who you ask, oil needs to be selling at $95 a barrel to keep the tar sands profitable. And if the tar sands and shale and fracking sites are unprofitable enough, the junk bonds that support them will go belly up. Per this bit from the Wall Street Journal, some 18% of high-yield junk bonds are in energy companies, most of them in unconventional oil extraction. According to Tarek Hamid, a high-yield energy analyst at J.P. Morgan Chase & Co, upwards of 40% of those could default if the price of oil stabilizes at $65 a barrel. As I write this, oil is edging toward $49 a barrel. Continued cheap oil has the potential to tank the stock market. Moreover, the appearance of cheap oil means that demand is still down. Abundant oil at this stage of the depletion game means the economy is heading into the tank–as Matt Simmons stated, you cannot have economic growth without growing energy use*. not a real economic snapshot–a composite drawing with lots of “Photoshopping”. 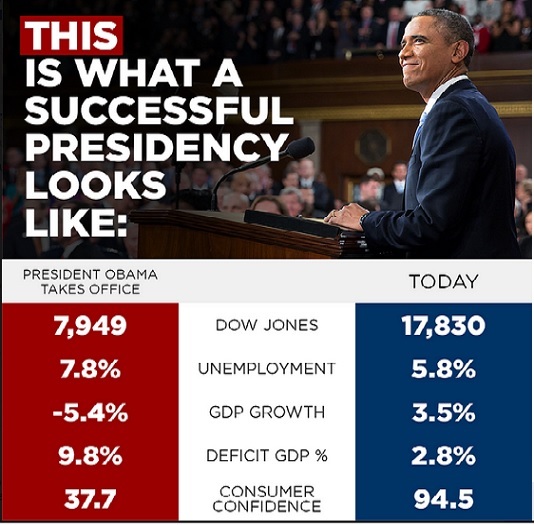 Some of the numbers mentioned in the Democrat poster above are not pertinent as to whether the economy is growing. Most of the non-energy sector growth in the stock market can be attributed to company buy-backs of their own stock. The Unemployment rate has been gamed (actually it has been gamed for a couple decades). You might even look at John Williams’ site Shadowstats for his take on what real unemployment would be if we counted it as we did back in the Jimmy Carter years. Ask any of these men if employment is back. The 2008 crash created huge structural unemployment, and the vast majority of jobs that have come back are in low-wage positions. Economist and former Clinton cabinet member Robert Reich argues that if we were truly in a recovery mode, wages would be increasing by 3-4%. Instead, wages continue to be flat relative to that economic growth bromide. As for GDP growth, Paul Craig Roberts is someone I’ve written about before, a former Reagan Treasury official who rode off the Repub reservation over off-shoring and the massive Bush tax cuts and the war. When the Obama administration broke the news that the GDP grew by 5% in the third quarter, he poked at the numbers here. He found that most of the growth was as a result of the ACA/Obamacare rollout and increased healthcare expenditures. And that was one of the few growth sectors for the economy: Real GDP growth of 5% in the third quarter is inconsistent with the sharp fall in key industrial commodity prices. It is not only oil (down 47%) but iron ore prices (down 49%), natural gas (down 30%), copper (down 15%). Pam and Russ Martens show that the fall in the producer price index for industrial commodities in 2014 is sharper than in 2008, the year of the crash. Needless to say, Roberts is predicting hard times ahead. One more fly in the ‘recovery’ ointment. Japan is in recession. Did you know that? Analysts are blaming the two quarters of negative growth on introduction of a new sales tax, thought I would suspect there’s a connection to the money-sucking problems at Fukushima. Japan is the world’s third largest economy, and a major purchaser of US Treasury bonds. It’s hard to see how one can talk about ‘recovery’ when the Japanese economy is flat on its back. And Japan is a geriatric society–one in four nationals are retirees. Who’s going to do the work to support all those folks? (Understand that I’m not lambasting Obama here. He has played a bad hand the way his advisers told him to play it, and maybe things would be different if the GOP had decided that in a time of national economic crisis, both sides should work together. The problem I have is that our economy does not need a Jiminy Cricket cheerleader. We need a Churchillian figure willing to give us the bad news. All the celebration and backslapping around our supposed economic ‘recovery’ is not changing the fact that we’re in bad shape and things are getting worse). What does it mean? Remember, I am the simple artist—I do not claim to be an economist or climatologist. There have been numerous analysts who’ve been predicting economic Armageddon since 2009. This is everyone from Peter Schiff to Gerald Celente, James Howard Kunstler, and almost anyone who has Alex Jones on speed-dial. The record of some of these pundits is spotty–someone remarked that one of them had ‘predicted seven of the last two recessions’. That said, some of the people doing the prognosticating (including the late Michael C. Ruppert and Guy McPherson) can lay out the case for something other than ‘market fundamentals’ being out of whack. James Howard Kunstler has written how economic collapse is fed by the churning of fossil fuel markets. And our economic problems compounded by failure of human habitat (because droughts in California and Texas agricultural land won’t go away). Guy McPherson talks about it at length here (cut to the chase by advancing to 2:30 if you wish). The point is that economic collapse and climate collapse are linked. We’ve been using fiat currency and casino games on Wall Street to prop up our economy for the better part of a decade. The fiat currency has caused us to buy up real things with ersatz valued paper. The status quo is killing our planet. * Update 4/2/2015: Starting a few weeks ago, there were a number of articles released by economic forecasting agencies (who should know better) postulating that we had finally achieved economic growth without increased energy use. But the dirty little secret is that the bulk of economic ‘growth’ we’re experiencing has nothing to do with real economic progress. It’s about the way the financial sector is creating products and shifting money to help balance sheets. If Chase is driving up its own stock price by buying back its own stock, that isn’t helping the economy in any way. THAT’S how you have economic ‘growth’ without using more energy. And it’s a scam to pretend it’s real growth.